We purchased a used forklift for our warehouse. We’ve always had this weird hybrid forklift pallet jack and “Pinky” (so-called because an employee spray painted it pink) finally quit working. 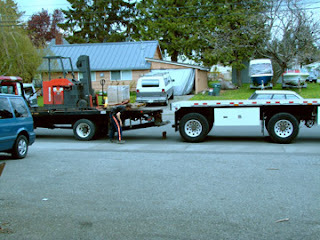 Getting a forklift off a flat bed truck is a challenge, especially when it has a dead battery and cannot be driven. We had to call a tow truck to pull the forklift off the flat bed truck. Of course this had to happen when every single guy had gone home for the day and there was no one there but two girls. Of course, we’re two strong, smart and wily girls, but non-males all the same. 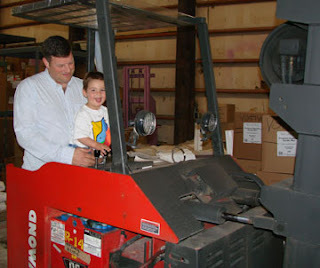 But, we got our forklift off the truck and all the boys in the office, including little Jorgen (Norm’s son), have been having entirely too much fun learning to drive it and generally terrorizing all the pallets that are sitting on the floor. The warehouse has been rearranged a lot in the last week! Previous Post: Go support your farmer’s market! Next Post: Air freshener use on the rise by teens?